Save the file, overwriting if prompted to. Open the GraphicsRules.sgr file with TextEdit, the same way you opened the GraphicsCards.sgr file. You can change this later via the in game settings to whatever suits you but all affected Macs should support this resolution. Save if prompted. Go to Applications > The Sims 3 then right click on your most recently released EP/SP installed. For example, if you have University Life and have not bought any subsequent EPs/SPs then right click on University Life. Select Show Original then right click on the highlighted EP/SP that shows up and select Show Package Contents. In the Bin folder you’ll see another GraphicsCards.sgr file and another GraphicsRules.sgr. Make the same changes to those that you did to the base game files. If it still isn’t working, follow the steps above for every EP and SP you have installed. 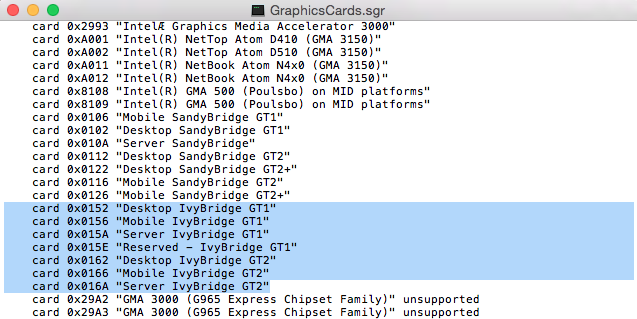 There may not be a GraphicsCards.sgr file in every Bin location. I wouldn’t add one but if your game still isn’t working then it wouldn’t hurt to try! For some reason it didn’t come up for me either. I had to search only “IvyBridge” for the line to appear in the search. Try searching just “IvyBridge”. The whole line didn’t come up for me either but IvyBridge alone did. I type ivybridge into the search bar but nothing pops up after iv.